The Newest addition to the Signature Stairs range, the 'Corbellian Stairs', is based on the Neolithic building practice of corbelling. In this process stones were stacked in a certain fashion enabling the structure to be self supporting. The Shape of our 'Corbellian' stairs mirrors this process with steps appearing to be stacked on each other to give a striking visual effect, especially when finished with frameless glass balustrades. 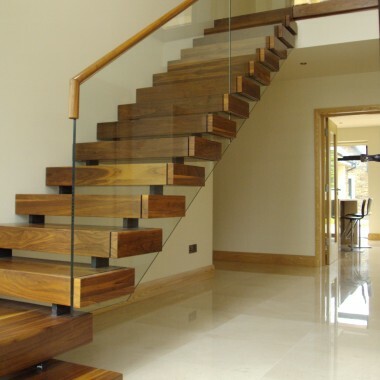 The walnut Corbellian is a fully clad metal structure stairs with solid thread plates and outer cover which conceals the fixings for the glass balustrade. To maintain the narrowest stringer possible the underside of the structure is finished with a matching veneer. This 'White American Oak' example highlights the exquisite solid timber finish to the outside of the Corbellian stairs. The 20 mm solid oak is rebated to conceal the fixings for the glass balustrade. 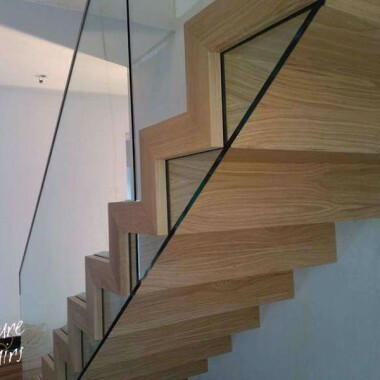 You will also notice that the glass runs through the steps and is finished with a rounded polished edge – this is preferable to a sharp corner of the step being exposed, particularly if there is any traffic under the stairs. 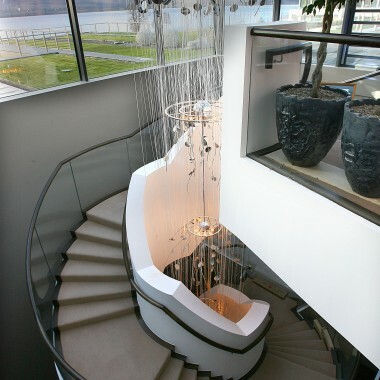 As with many of our stairs options the Corbellian is finished with 15 mm clear toughened glass balustrade. This glass is chosen for its safety benefits and is available in a low iron option if desired. 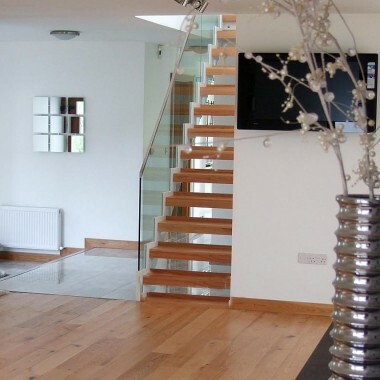 All glass balustrades are finished with either rebated timber or stainless steel handrail options. The 'gooseneck' step-up in the glass where the stairs meets the gallery railing enables a seamless continuation of the handrail to the first floor railing. The frameless glass not only floods the stairs with unhindered light but also adds to the sense of space on the first floor area. Working from accurate site measurements and conditions our drawing specialists prepare detailed 3-D and CAD drawings which are given to the client or their architects for approval prior the project going into production. Any detailing or fixing issues are solved at drawing stage. Once approved an installation schedule is agreed. Clients are given detailed 3-D as well as CAD drawings which highlight the main staircase features. Clients will get a feel for what their finished stairs will look like and the main contractor et al will have the required fixing details etc. to ensure the best possible finish. Each thread is finished with a 20 mm solid timber cladding top, front and back with a matching veneer to the underside of the stairs. For stability of the timber and longevity of the stairs, steps are constructed from two or three solid boards. This form of structure is specifically designed to control the possibility of shrinkage or warping of the timber. Steps are then protected using a low sheen polyurethane lacquer and pencil routed edges. The stainless steel 'Sleeve' handrail is just slightly wider than the glass balustrade and sits directly over the glass edge in this staircase example. On the practical side it conforms to stairs regulations and protects the glass form finger marks but is subtle enough so not as to be visually obtrusive. Looking for inspirational stair ideas? The newest addition to the Signature Stairs range is the ‘Corbellian’. A beautifully crafted stairs, the shape of the Corbellian was inspired by the Neolithic process of stacking flag stones to create a self supporting structure. The stunning synergy of craftsmanship and new age materials make the ‘Corbellian’ a beautiful feature stairs. The structural design ensures the stairs is as thin as possible while still exceeding the stringent deflection rates which we insist upon. These deflection rates ensure all our stairs feel solid to walk on and will last for generations. The Corbellian stair is made with closed rise steps and can be finished in one of the multitude of solid wood choices on offer. The balustrade is safety, clear toughened glass and the rounded edge of the balustrade is finished just below the line of the steps. The handrail of your chosen stairs can be a matching rebated timber handrail which sits directly down onto the glass balustrade or you can choose a more contemporary stainless steel ‘sleeve’ handrail. I just want to compliment you on the level of professionalism from O’Carroll’s. To date you have been head and shoulders the easiest supplier to deal with, and the end result is fabulous – exactly as we had envisaged it. So thank you!